Genuine British Ration Books from 1939. From the Quince Tree blog. Had German spy Josef Jakobs landed uneventfully in Huntingdonshire on the evening of 31 January, 1941, he would still have faced a number of hurdles on his way to London. Wartime Britain had instituted food rationing in January 1940 and every man, woman and child required a Ration Book. All food items were rationed: sugar, tea, meat, bacon, butter, margarine and fat. In order to purchase food, Josef would have needed to present a Ration Book. The British authorities issued different ration books for different groups. 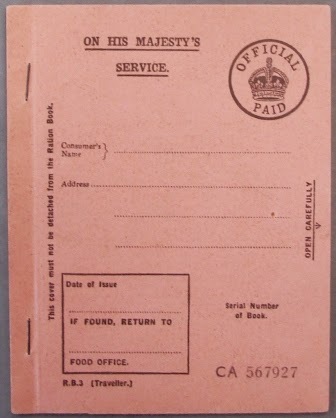 The general Adult ration book was a buff colour. Soldiers on leave received a different style of Ration Book. Later in the war, children were also issued with slightly different Ration Books. Held at the National Archives. 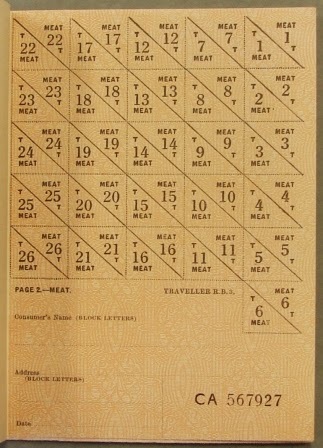 The German Abwehr provided their spies with forged Traveller's Ration Books. These Ration Books were pale pink in colour and were to be used while a person was in transit. The Ration Book issued to Josef Jakobs was notable in several respects. The book had none of the particulars completed. The inside was completely blank and the book looked brand new. It was sent to Sir Sylvanus Vivian, the Registrar General, for inspection. He noted that normally a ration book would be expected to contain forged entries and food stamps. Anyone found with a completely blank ration book in their possession would probably have been arrested on the spot under suspicion that they had stolen it from a Food Office. Vivian thought that perhaps the Germans did not feel safe in forging the particulars added to a normal ration book. Inside page of Josef Jakobs' Ration Book. There is evidence to suggest that the particulars of Josef's ration book, including the serial number (CA 567927) were handed over to the Germans by British double agent SNOW and his sub-agent BISCUIT. The Ministry of Food said that Josef's ration book bore a genuine number and was part of a consignment of books that had been sent to the War Office (the headquarters of MI5). MI5 knew what serial numbers the Germans would use because they had sent the information to them! Czech-born German spy Karel Richter who arrived by parachute in England in May 1941 was also issued with a blank pink Traveller's Ration Book. While the Germans might have thought that they were equipping their agents with well-forged documents, the truth was that even a cursory examination of their Ration Books would have resulted in the arrests of Josef Jakobs and Karel Richter. Happy to rely on the information sent over by SNOW, the German Abwehr sent poorly trained and equipped men to their ultimate deaths.